measures up to 30 cm long and can weigh up to 2.5 kg. The exterior is dark green because of its bark pricked with thorns and its pulpy flesh is white with black seeds. 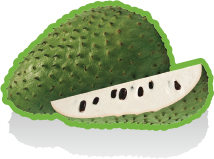 The flesh of the Guanabana is creamy and sweet, it tastes both sweet and tart. Its taste evokes an exotic flowery, delicate flavor, fresh and persistent.